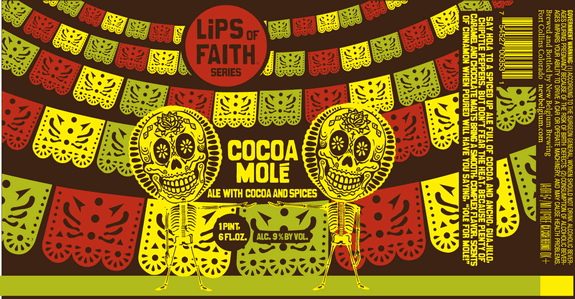 COCOA MOLÉ is a chili beer in New Belgium’s Lips of Faith series. It clocks in at a hearty 9% ABV (prior to aging). Let me begin by saying I don’t know whether or not to include the acute accent on the “e” in “Mole”. The New Belgium website doesn’t use it, but it appears on the bottle. Who knows. I’ll use it both ways as to not upset either crowd. Cocoa Mole pours a mid-range color of brown with maroon highlights where the light hits it. A 1/2 inch of off-white head quickly fades, leaving behind splotches floating on the surface that look like pond scum (not appetizing, but accurate). Bubbles hang out just beneath the surface and stay there for the duration. Lacing is present in the form of dots and dashes splashed along the sides of the glass. Mild chocolate malts, cinnamon, and bread dough were the most obvious scents. This combination of the cinnamon and dough actually made me think of a churro (totally not racist). Brown sugar is also fairly big in the nose with a tinge of pepper hiding behind it. The taste is very reminiscent of cinnamon toast (toast, cinnamon, sugar) and/or a churro. The brown sugar comes back through in the middle and joins forces with the cocoa creating a pleasant sweetness. These flavors are quickly overpowered by the chilies, which appear to want their time in the spotlight and are willing to fight for it. 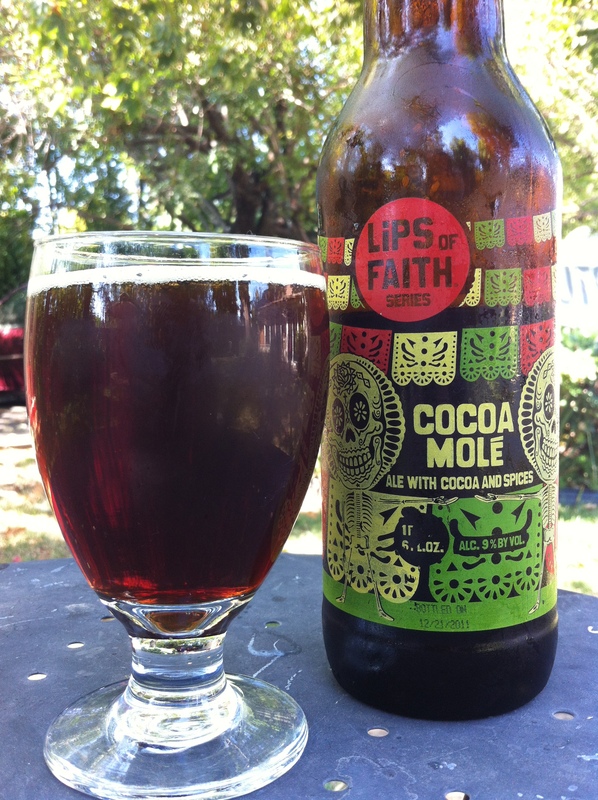 Cocoa Mole is very sweet, but also pleasantly hot, and definitely a dessert beer. My friend Chris said it reminded him of Cinnamon Toast Crunch and he’s not incorrect. Mouthfeel is light and carbonated. The tingle that the bubbles bring transitions right into the tingle that the peppers bring. A pleasant heat will stay with you long after the beer is gone. This is definitely a high concept beer (ie a beer that can be described in one sentence). The folks at New Belgium set out to make a Mexican dessert beer and they succeeded. The sweetness made me think of churros and the peppers brought on thoughts of an assortment of tasty Hispanic dishes. Even though I couldn’t drink a bunch of this beer (one 22 oz. bottle was enough), it would follow a meal full of burritos and tamales splendidly.